The COOLSHOT 80i VR represents a major step in golfing technology by helping alleviate the effects that cold, wind, unbalanced position, physical exertion or just plain-old tournament pressure can have on a golfer. Nikon’s optical VR technology reduces external vibrations caused by inadvertent hand movements while ranging objects. For golfers, this means the target mark on the rangefinder remains stable, even when the body of the rangefinder is being moved. Not only does this provide the user with a steady image, it also stabilizes the activated laser, allowing it to maintain greater alignment for enhanced measurement performance. The COOLSHOT 80i VR provides distance readings from 8-1000 yards. Readings are displayed in .5-yard increments and thanks to Nikon’s HYPER READ technology, the measured distance is displayed with a fast, stable response, regardless of how far you are from the target. Distance readings are accurate to +/-0.75 yards/meters when measuring less than 700 yards/meters and are accurate to +/- 1.25 yard/meter when measuring farther than 700 yards/meters. THE COOLSHOT 80i VR features Nikon’s new LOCKED ON Technology and employs the First Target priority mode. These features give golfers confidence when measuring overlapping subjects such as a flagstick with trees in the background, to ascertain that when the LOCKED ON sign appears, golfers know that they are reading the distance of the target closer to them. Press and hold the power button and the rangefinder will continuously measure range for eight seconds. This is great when trying to find measurements of multiple or very small or thin objects, allowing you to know the distances to hazards, pins, mounds, and trees. With this feature, you have the ability to know everything you need to know as you approach the green, and target the cup. 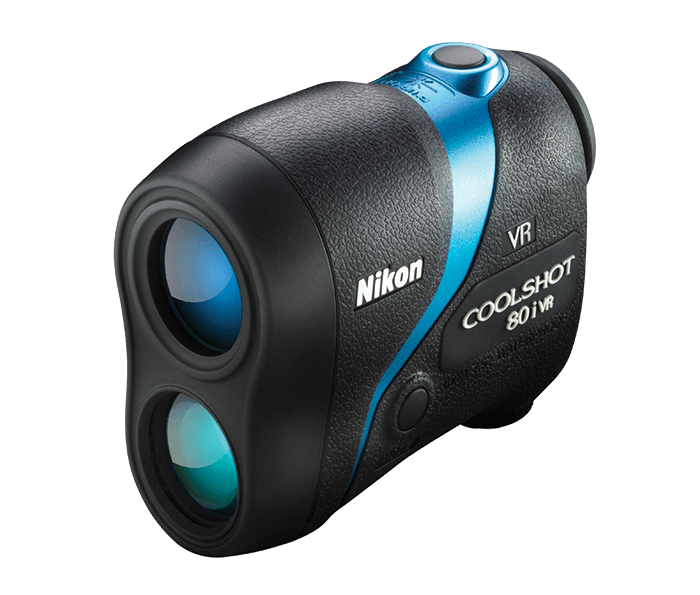 COOLSHOT 80i VR features Nikon's ID (Incline/Decline) Technology to compensate for uphill or downhill slope. This feature can also be disabled to become USGA compliant for tournament use. ID Technology displays slope-adjusted distance (horizontal distance ± height), enabling you to select the proper club for uphill or downhill shots. With ID Technology, the COOLSHOT 80i VR displays slope-adjusted distance (horizontal distance +/- height), as well as to-the-target distance. enabling you to select the proper club for uphill or downhill shots. This ID Technology feature eliminates second-guessing on how far uphill or downhill a shot will play. With so many unforgiving elements on a golf course, don’t let elevation change be one of them.